There are plenty of packages floating around the Internet with just the adb and fastboot utilities for OS X, but I prefer installing those (and few other android utilities) on OS X is via Android SDK. 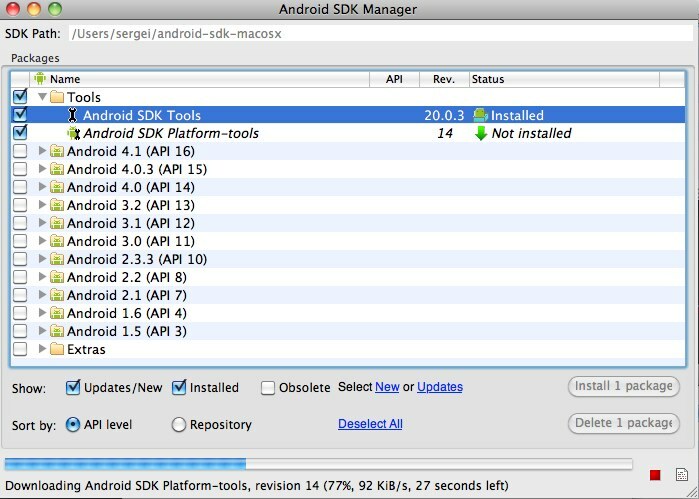 This way you know exactly what you're getting and it's easy to can keep them up-to-date with Android SDK Manager. First download the latest Android SDK package from http://developer.android.com/sdk/index.html (android-sdk_r20.0.3-macosx.zip at the time of this writing). This creates a android-sdk-macosx directory in our home directory. 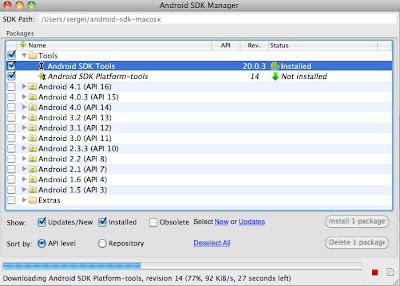 Now run android application inside the tools directory to open Android SDK Manager (ASM). ASM will connect to various repositories and present you with all possible Tools, Platforms and Add-Ons that could be downloaded and installed. Since we're only interested in few specific tools, deselect all except "Android SDK Tools" and "Android SDK Platform-tools" packages and then install / upgrade them. Note: to accelerate checking for updates during future runs, go to "Tools"->"Manage Add-on Sites..." and click on "Disable All" button in "Official Add-on Sites" tab. From now on ASM will check only the default repository containing tools and APIs.